Tractus3D. 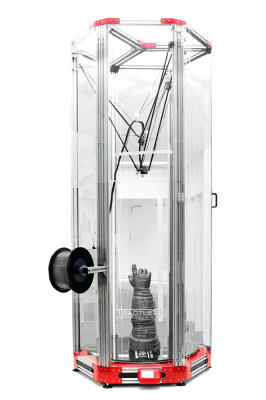 A Seriously Large-Format 3D Printer: add an extra dimension to your POS offering! Retailers and big brands are looking for new ways to make a statement. Until quite recently, investing in 3D-print technology was out of reach for most, but Papergraphics has taken on the brilliant new Tractus large-format range to open up new opportunities for our clients wanting to enter into this creative and exciting market. 3D printing is now an affordable reality and will allow you to create unique and impressive 3D objects with precision and ease. Here's the technical bit - Tractus T series utilises fused-filament fabrication (FFF) technology (also known as Fused Deposition Modelling) - this is a 3D process that uses a continuous filament of thermoplastic material that is fed from a large coil, through a moving, heated printer-extruder head. The molten material is then forced out of the print head’s nozzle and is deposited on the 3D object in the making. The head is moved around the object using computer-programmed controls to define the printing shape. With the T3500 you can produce models up to 2-meters tall in a single run and this not only makes you more productive as you can leave the printer to run unattended for longer, but it also reduces the amount of post-printing work needed as the 3D printed object will have fewer joins. Papergraphics has developed a range of filaments to compliment the Tractus3D to achieve the best results. We can even produce bespoke colour filaments, matched to whatever Pantone colour your heart desires. Tractus3D printers are exceptionally accurate and the output quality is superb. You will be able to print precise, easy-to-repeat and striking 3D objects each and every time. It may take a little bit of training, but the rewards are worth it. Papergraphics has its own in-house specialists ready and waiting to train you up in the programming and print process on this superb new technology. Why settle for standard 2-dimensional printing when you can add 3D and have the high-impact, wow factor that will certainly get noticed and be remembered. Sound interesting? … IT IS! Give us a call. The 'estimated time remaining' shown on the printer console has to be taken with a pinch of salt ... it's a bit like Microsoft when your installing updates !!! Incredible resolution: When designing exquisite models, you want them to be as detailed as possible so that you can truly see the expertise put into it. After all that effort, being disappointed with the end result would be the last thing you want. With a resolution of 0,02 millimeter (10 microns) on the XY-axis and a resolution 0,05 millimeter (50 microns) on the Z-axis, our big delta printer can capture even the finest details. No standstill: In unforeseen circumstances, such as a power outage, you can continue your print from where it left off. This way, we ensure quick, foolproof printing processes and reduction of material waste. Once the delta printer runs out of filament, it will go in stand-by mode, in which the nozzle will move to the side. Once you have added new filament, the print will continue where it left off. Robust construction: When you own a Tractus3D printer, you own a machine of superb quality. Made of aluminum with a bulletproof, lexan casing, the big delta 3 printer is robust and durable. 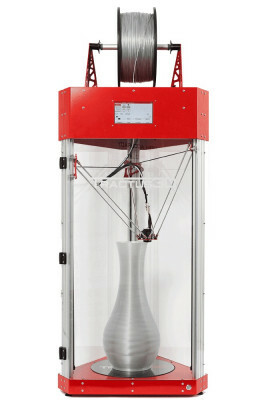 Low weight: The big delta 3D printer weighs a lot less than most printers, making it possible for you to move without having to take it apart. Installed on location: We understand you want to start using your new big size 3D printer as fast as possible. Our big delta 3D printer is installed on your location by one of our engineers. Allow things to run its course and in a few days your printer will be ready to go. Fast printing speed: When using a big size 3D printer, you will want to see your finished object as soon as possible. At Tractus3D we know this feeling all too well, which is why our 3D printing speed goes up to 300 millimeter per second. With this speed, your favorite large 3D models will become reality in no time. However, when you require objects with great precision, it is probably wise to print a bit slower for a higher accuracy. Easy filament loading: Once your big delta printer runs out of filament, it will go in stand-by mode, in which the nozzle will move to the side. Once you have added new filament, the print will continue where it left off and finish your object. Work in peace: Operating at extremely low decibels, the big delta 3D printer fades into the background to provide you with an undisturbed working environment. Touch control: The touch screen gives you the ability to modify the settings you require for your large formats prints directly on your big delta printer using a modern and advanced interface. Easy maintenance: As is possible with any machine, some parts of it can malfunction or get worn over time. If this unexpectedly happens, you can simply buy a replacement which you can easily install yourself. If you require assistance, our skilled engineers are always ready to offer support.